Commentary on researching, restoring and flying vintage aircraft from another time. When I am researching vintage aircraft out of personal interest, an article for this blog or to answer a friends question about a rare type I grab one of the books off my shelf published by Eric Presten. Eric has traveled the globe to fill his self published books with quality photos of rare aircraft types. His newest release, VINTAGE FLYERS III is a must have for the vintage aircraft enthusiast. This past summer my wife and I traveled to Sonoma, California on vacation. We made a point to spend some time with the Presten's and Eric was kind enough to give us a preview of his new book. VINTAGE FLYERS III is now available for purchase. For the readers of this blog I interviewed Eric so that you could get a glimpse behind the scenes of his newest release. Dan: Vintage Flyers III is your newest release, What sets this book apart from your previous projects? Eric: We have covered 144 new types that have not been covered in previous volumes in the series. There are over 660 pictures that I have never published before, and I have changed the layout a bit so that I can include more vertical type pictures that are usually shot for magazine and book covers only. It is also much larger. It has more pictures at 1015 color images (the last book only had 795) and is 48 pages longer. We also used a much higher quality gloss paper stock for this book, as the paper industry has improved in the last six years. Dan: What was the most unique photo shoot location featured in this book? Eric: We have done many sessions in the UK since the last book was released. It is much harder to do air-to-airs over there as photo planes are much harder to come by, the weather is very unpredictable and the costs are much higher in every category. On the plus side the citizens of the UK are much more aware of the pictorial beauty of their country, and strive to control the building of ugly, cluttering buildings like we build over here. It's therefore much easier to get a nice background "over there" then it is in the US. Dan: Many of your photos are air to air, what is one of your most memorable shots in this book? Eric: Well, even just centralizing on some of the air-to-airs that are new to this volume, there are still many to think about. Seeing one of the last two flyable Douglas DC-2s form up alongside the photo ship was a big thrill as was flying with the last flying Boeing 40. These are icon airplanes no matter how you look at them. On the other hand, we try to cover the airplanes that are mostly forgotten as unimportant types by other publications. Some of the airplanes that might fit into this category that we were able to get next to in the air are a Heath Parasol on a set of wooden floats (shot from the Curtiss JN-4H Jenny that I was flying into Oshkosh), the original one-off Kadiak Speedster racer and the Bucker Bestmann monoplane. Replicas are also a great source of air-to-airs such as the Caudron C.460 Thompson Trophy winner, and the Stinson Model O open-cockpit parasol. Some of my own favorites involve the nice places where they were photographed. The Alexander Eaglerock over the very flat plains of Great Bend, Kansas (shot from a Travel Air 6000 cabin monoplane with a passenger window rolled down), the last two flying Pobjoy-powered B.A. Swallows in formation over the very picturesque English countryside of Compton Abbas, and the all-wood Miles Gemini twin over the hallowed ground of Old Warden Aerodrome where the Shuttleworth Collection is housed. Many great memories saved for all through the medium of air-to-air photography. Dan: Tell us about a few of the new aircraft types that are featured in this book. Eric: Some of the great ones, like the Art Chester "Jeep" racer, the Boeing P-26 Peashooter, and the Curtiss P-36 Hawk. Some of the really rare types, like the Anderson Bi-Wing, the Bristol Boxkite, and the Corben Cabin Ace, and some of the just plain interesting ones, like the Annec II, the B.A.C. Drone (that is not really a pilotless airplane), and the Curtiss Pusher on floats step taxing in the San Diego Harbor. All of these are found just in the A, B, and C sections of the books index. Dan: How do you choose from your expansive photo collection what aircraft types make the cut? Eric: We tend to concentrate these days on chasing down and photographing (all over the world) types that qualify for the Vintage Flyers Series in the first place, so the photo collection is now becoming tailored to these types. These books are intended for vintage airplane people so the types included are limited to piston-powered airplanes that were first flown in prototype form before the last day of 1955. Dan: Give us a full description of the book and tell us how we can place an order. 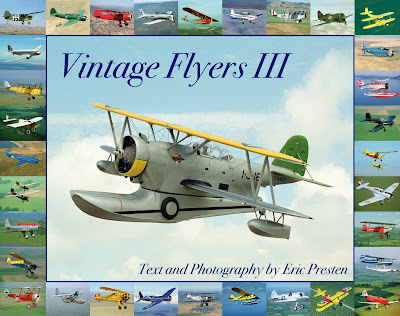 Eric: Vintage Flyers III features 1015 color pictures of 1047 pre-1956 restored vintage airplanes. 528 pages hardbound all done on a new very high gloss paper stock. There are 695 different piston-powered types covered (144 new types since our last book) from all over the world (20% of these pictures were taken at events and private collections that are in foreign countries). There are 430 air-to-air pictures covering over 300 different types. Over half of the pictures are in flight shots, and 219 of them are large format pictures that measure at least 10 inches in frame size. Over 60% of the pictures included have never been published before, and they are accompanied by 136.000 words of text. There are photos from thirty US states, six countries, and three continents! There are 87 seaplanes, 156 multi-engine airplanes, 270 biplanes, 331 military marked examples, 363 open cockpit airplanes, and 507 radial powered machines. There are even eight types of tri-motor airplanes. A dozen types are shown on wheels, floats and skis. Airplanes covered span the pioneer, the WWI, the golden age, the WWII, and the classic eras. Thanks for the interview, Eric! The Mighty Howard 500 was a conversion from a Lockheed twin that makes a ramp presence like very few airplanes today. If you were to see a Howard 500 on a ramp full of Challengers, Gulfstreams and Falcons... which do you think YOU would be drawn to? Watch the video above and tell me you wouldn't skip the others and walk around the Howard! Thanks to collector Toni Phillippi in Minnesota there are now two preserved Howard 500's in flying condition. I first saw the Howard 500 at Oshkosh and walked by it several times a day for the week that I was there. The powerful twin just draws you in. If I were assembling a dream fleet of airplanes for my personal collection, A Howard 500 would be my traveling machine! The video above shows that Mr. Phillippi flies his Howard's all over the country and even went to great lengths to return one from Europe to the United States. Exceptional 1977 Great Lakes 2T-1A-2 offered for sale. 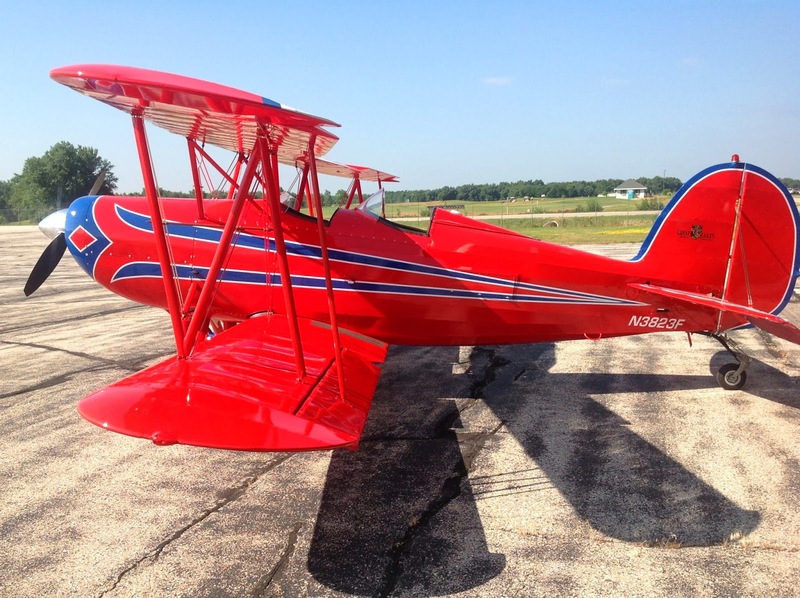 The Great Lakes is a wonderful biplane and is a very capable entry into moderate level aerobatics, that is also fun to fly low and slow with the wind on your face. It will do everything a Stearman does, but fits in a t-hangar and only burns 10gph. It can easily be rolled in and out of the hangar with one person. Back in 2003 my dad and I flew the 170 up to Bartlesville, OK for the annual fly-in. The weather was great and it was a nice flight. Clear blue skies. This was one of my first aviation events with my new digital camera. The event produce a good number of great pictures. One unique airplane on the field for the event was the Grumman Widgeon N4453. This Widgeon has the radial engine conversion so it looks much like its big brother the Grumman Goose. When I inspected the airplane I was surprised to see that this airplane's history had it on TV for the show "Fantasy Island" as "De Plane." N4453 now calls Brandson, Missouri home. Included in this post are a few pictures of this famous seaplane. Flying has been Dan Linn's passion since he was young. In 1991 he obtained his private pilot's license and has been researching and flying vintage aircraft ever since. He is the former owner of a 1946 Taylorcraft BC-12D and a 1956 Cessna 170B. Apart from his day job at Learjet he can be found researching vintage aircraft and spending time with family. Dan makes his home in Texas where he lives with his wife Candice and son Brennen.